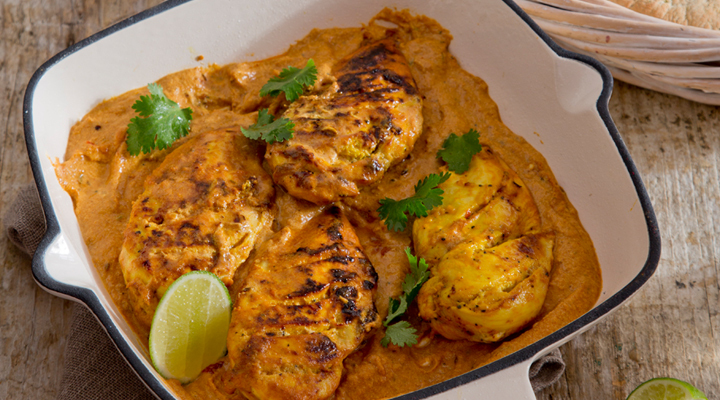 Skip the friday night takeaway with this flavour-filled chicken dish. Serve with a crunchy winter salad for some extra healthy brownie points. 1. Cut a few light diagonal slashes in the chicken and place in an ovenproof baking dish. Pour the lemon juice over the chicken, then sprinkle over the turmeric and cumin. Add the oil and turn to evenly coat the chicken. Allow to marinate for about 30 minutes. 2. Meanwhile, mix the garlic, ginger, tomato purée and spices with yogurt. Spread this over each chicken breast, making sure to rub it into the slashes. Leave to marinate in the fridge for at least 2 hours but preferably overnight. 3. Preheat the oven to 200°C/ gas mark 6. 4. Bake the chicken in the oven for 25 minutes, until it is completely cooked through, basting it with the marinade now and then as it cooks. 5. Garnish with fresh coriander leaves and serve with warmed naan bread, mango chutney and lime wedges on the side.